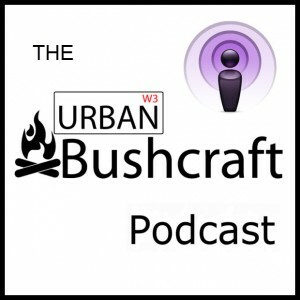 If you like the outdoors, survival, gadgets and banter then check out the Urban Bushcraft Podcast!! 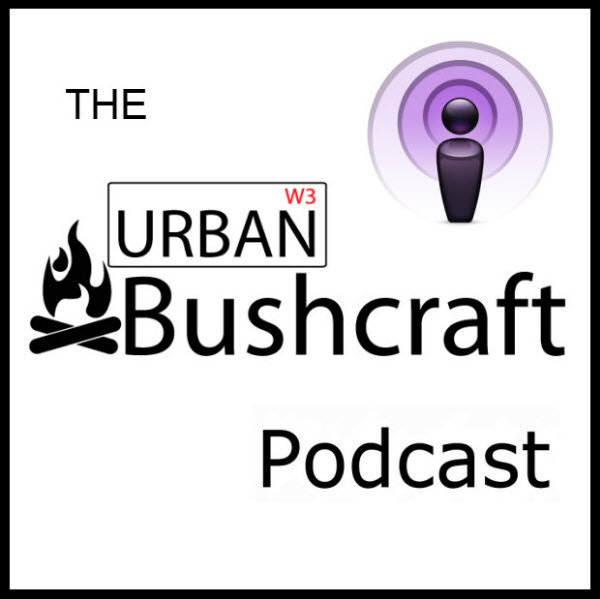 Episode 22 – Episode 22 see’s one half of the Urban Bushcraft podcast visit the Outdoor Trade Show and make some announcements about who will be at the Bushcraft Show 2015, Ray spends time with Ben Orford in the matrix working on his new website, we talk about what we would like for Christmas (just in case anyone wants to get us some gifts), Mark about citrus not onions and then we have a clip with Terry & Andrew about eating bugs after planting poppies at the Tower of London. Episode 21 – Episode 21 as the Summer goes hiding we recap what we have been doing these past few weeks. Mark talks about wagon sticks and silverbacks, Ray talks about Gilwell 24 and James Harris gets another plug for his Castaway Challenge. Episode 20 – Episode 20 as the weather heats up we talk about hydration and comparing on the main stage at The Bushcraft Show 2014. Ben Orford also shares a knife sharpening tip. Episode 19 – Episode 19 with 10 days until The Bushcraft Show 2014 we have some contests that will close on the 21st May, so you will have to be quick to be in with a chance of winning a specialist instruction session with Cody Lundin or Bear Grylls t-shirts. We discuss mobile power solutions to power your smart phone at camp and Paul Kirtley kicks off a new feature where he shares some tips on navigation. We look forward to meeting you at The Bushcraft Show 2014 at Catton Hall on the 24th to the 26th May 2014. Episode 18 – Episode 18 brings us one episode closer to The Bushcraft Show 2014 and we manage to grab an interview with Simon & Olivia. Questions answered in this show include how does Bear Grylls sign off his emails to Simon and what flavor sandwich will you get made if you went to Lofty’s for lunch. We find out what this years show will have in store and announce an exciting contest to win a tuition session with Cody Lundin at the shows new location at Catton Hall on the 24th to the 26th May 2014. Episode 17 – In episode 17 we hear why shopping under the influence is not a good idea, get excited about the Bushcraft Show 2014 and talk about Frontier Bushcraft’s upcoming tracking course with David Scott-Donelan. Episode 16 – Again we venture out to Malvern to interview Ben Orford and talk about knife sharpening, leather working and ask some listeners questions. Episode 15 – In this show we get some leather pouches from Al in Canada. Catch up with IEAT Scouts and David Willis at the 8th Ealing Scout Group Centenary camp. Discover that Mark is a Burner not a Carver when it comes to wood. Terry we need to convert him. Talk then turns to what we want for Christmas from the big red fella and how to make a hobo stove. We announce the winner of the Shark Tinderbox and North West Bushcraft Competitions, then bring you a new contest to win a copy of Ray Goodwin’s “Canoeing” book. Mark learns that Ray will always forget anything you ask him to do when he is carving. Breaking news from Frontier Bushcraft, who will be offering courses in Sweden next year. Also Paul Kirtley has 20, that’s right 20 free videos for you to watch. Episode 14 – After four shows out and about we get together in the studio, congratulations to Joe O’Leary on his new addition. Ray talks about leather working with Shark Tinderbox, Mark reopens the Hand made vs Mass Produced Products vs Army Surplus debate. Adrian from North West Bushcraft talks about home-made fruit leathers and Richard from Original Outdoors catches up with the Northern Soul Bushcrafters in North Wales. There are competitions with prizes from Shark Tinderbox and Northwest Bushcraft up for grabs. Episode 13 – Road Trip! For the 4th show in a row we travel off to do some recording, this time heading to Sussex to meet Roger and his motley crew from @1 with Nature. Where we discuss all manner of outdoor nonsense, Adrian Rose from North West Bushcraft shares a wild food recipe and we announce the winner of the Ben Orford tshirt from episode 10. Episode 12 – The Bushcraft Show 2013 Part 2. Continuing on at the Bushcraft Show 2013. In this episode talk blacksmithing with Andrew Kirkham, how to use a fire piston with Bushcraft Tools, talk flint knapping with Hands on Bushcraft, it’s all about KAOS with Jack Raven Bushcraft, chat about kilts with JP from Woodlife Trails, talk tinder and leather with Mark from Shark Tinderbox and discuss surplus with Military Mart. Kufurahia. Episode 11 – The Bushcraft Show 2013 Part 1. For the 11th episode of the Urban Bushcraft we redeemed all our wife points and headed north to the Bushcraft Show 2013. In this episode we eat lunch with the Bear Grylls Survival academy, Horse leather with the Identity store, meet the Hulk at the Bushcraft and Survival skills magazine stand, talk with Jason and Daniel about Woodland Ways and the Oloip Massai dance troop and learn about Bush Botherers with Ray Goodwin. Kufurahia. Episode 10 – For the 10th instalment of the Urban Bushcraft we venture out to Malvern to interview Ben Orford and talk about knives, get tips on getting started with making knives and Ben’s first trips into London. We also have a contest to win a Ben Orford t-shirt. Episode 9 – In this episode we talk about the Bushcraft Show 2013, announce the winner of the paracord bracelet from I.E.A.T Scouts, play an audio clip from our listener and give a first impression review on the survival bracelets from Wazoo Survival Gear. Episode 8 – The Best in Bushcraft results are out, we talk about the Outdoor Show and Ray introduces @1 with Nature. Nick Allen explains how to tell the time using the stars. We also set the record straight on where Guam is. Episode 7 – In what was planned to be the last episode of 2012 (but turned out to be the first show of 2013) we announce the winner of the Frontier Bushcraft contest, talk about what we want for Christmas, first aid kits and what you should have in them. Making some Christmas gifts, highlights of 2012 and some of what we have coming up in 2013. Episode 6 – In this show we plead our case for the Best in Bushcraft Awards 2012, talk some more about modifying your Mora knife, Mark talks about his trip to Gilwell Reunion 2012, list off some Christmas present ideas and answer some listener questions. Episode 5 – In this show we interrogate interview Paul Kirtley and give away a place on a Bushcraft and Survival Foundation Course from Frontier Bushcraft, we will also draw the winners of the contest to win some goodies from Heinnie Haynes. Episode 4 – In this show we discuss should you undertake some training in first aid or basic survival before heading off into the outdoors, talk about hammocks and the upcoming Sky Camp for Explorer Scouts and Scout Network, review Cody Lundin’s guides on building survival kits along with the Pathfinders waterproof guides. We also talk about the Ben Orford neck knife, the domain name forestexplorers.co.uk is available for sale and discover camping discount codes. Episode 3 – In this show we talk about our day at The Bushcraft Show and what we purchased at the show, discuss the Bear Grylls knife range, Mark briefly reviews Facing Up and Facing the Frozen Ocean and we interview John ‘Lofty’ Wiseman. Episode 2 – In this show we talk about The Bushcraft Show , Preparedness, UK Knife Law, Share our favorite tinder tips, review The Little Book of Whittling and have a competition to win a DD Hammocks T-shirt. Episode 1 – In this show we talk about how we got into Bushcraft, an introduction to Survival Kits, talk about a Bushcraft Course we went on and have a competition to win a BCB Trekker Survival Kit.